What Was Martin Luther King's Dream? 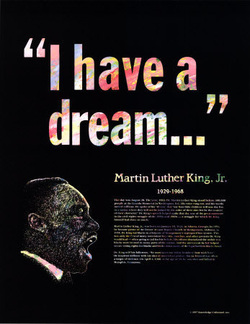 I believe that Martin Luther King’s dream was to have peace in the American society. To have equality between all people no matter what you looked like, what your skin color or what your nationality. To have all people seen as equals and not discriminated against. To have an understanding that all men are created equal and are all the same to God. Dr. King was trying to get through to people that the violence and hatred needed to stop because we were all people who live on the same earth. My Personal Experience with "The Dream"
Dr. King’s dream has certainly come true in many ways. Take President Obama for example. The first African American president in U.S. history after so many things like slavery and unfair treatment against blacks. We have come from being in the slave house to the white house. The Civil Rights Movement definitely helped the progression of African American's rights in America. With public demonstrations, rallies, boycotts and freedom rides, the African American race was given the right to ride on the same public transportation, eat at the same restaurants, and go to the same schools as the white race. The Civil Rights Movement also gave African Americans the right to register to vote. Since Martin Lither King's time, there have emerged many African Americans who have become very successful and influential like Oprah Winfrey, Tyra Banks, and Bill Cosby to name a few. We have accomplished and are doing so many good things and have become very proud people. Although Martin Luther King's "Dream" has brought us a long way, there still seems to be a long way to go. Although African Americans as well as other races have been given certain civil rights, they seem to be violated on a daily basis. There is still racial inequality in existence in the year 2010. The new law that was passed in Arizona a while ago giving the authorities the right to racially profile anyone who looks "Mexican" or "Latino" is an example. African American people are still not getting the full respect and equality that they deserve, Hurricane Katrina being an example. Thousands of people died, thousands of homes destroyed and it took way too long to respond to the calls for help. Neighborhoods that are predominately African American in New Orleans still in ruins from the storm years later. 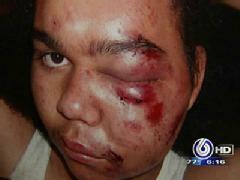 Police brutality against young black males is still an issue and police misconduct is on the rise. Authorities are dealing with situations with extreme and excessive force and only given a slap on the wrist.